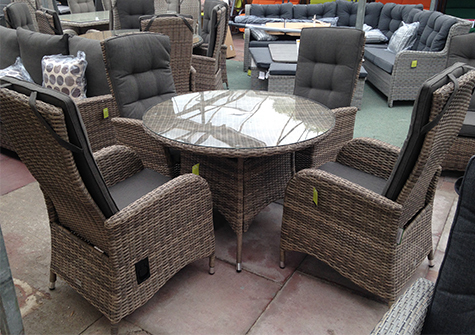 Over the last few years this extra comfy reclining rattan furniture has become a local and national favourite! You can choose from a range of reclining bistro sets for the patio, sofa sets for relaxed dining, or more formal dining sets. All of these come with high backed reclining chairs and cushions. 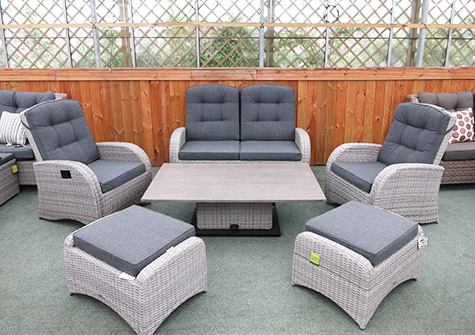 These reclining rattan furniture sets are made with premium quality materials, with UV stabilized synthetic rattan weave that will not rot, fade or go brittle in any weather conditions, and a strong aluminium frame that will not rust. 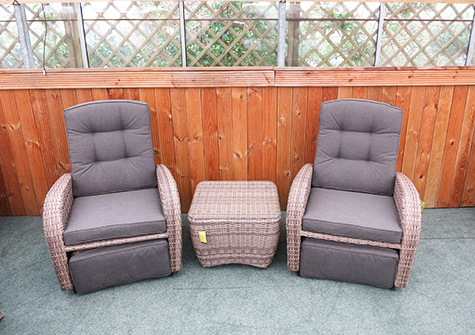 This combination makes these reclining rattan sets 100% all-weather so they can be left outside year round without the need to cover or store them over the winter months – just store the cushions. 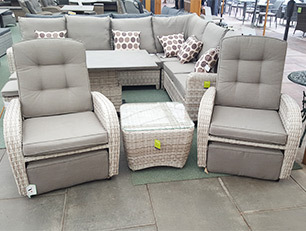 This luxury rocking reclining patio set comes complete with 2 rocking reclining armchairs with built in foot rests (cushions included) and a square glass topped table. This set is available in a choice of 3 colours. 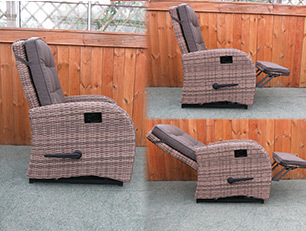 With two easy to use levers you can just have the footrest up, just have the back reclining or really relax with both! You do not have to have the chair fully reclining – you can find the perfect position to suit you. The gentle rocking motion – produced with little effort – is sure to have you relaxing in no time. This luxury reclining sofa set comes complete with 2 reclining armchairs, 2 footstools (cushions included) and a rectangular glass topped coffee table. This set can be customised by swapping either one or both of the reclining armchairs and footstools for rocking reclining armchairs with built in footrests and/or swap the glass topped table for a stone topped extendable table. This set is available in a choice of 2 colours. Everyone will be able to find their perfect position your new reclining chairs, as the patented pump technology allows for unlimited backrest positions. The chair backs are controlled by the lever on the side of the right arm. The rocking chairs also have a footrest built in, which is extended using the arm on the right of the chair. 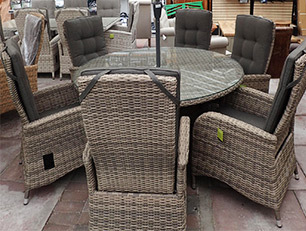 If you want you can purchase these reclining rattan garden chairs on our shopping website here. For a more formal dining experience, you will love our range of reclining dining sets. These sets come with a round table, and either 4 or 6 reclining chairs, which are high backed and have cushions included. The glass on the top is safety glass to ensure no harm will come to you if it becomes damaged, and they can be left on your patio all year round. To shop the full range online for UK wide home delivery, click the button below. You can also visit our showroom to browse all furniture sets to your hearts content, click here to get directions. Please note that in-store prices will differ to those online as delivery is not included in in-store prices. We often also have ex-display deals in-store that are not available online. For our latest offers or for more details please come in store or phone our garden furniture experts on 01455 274748. You can also see reclining rattan furniture on Babyplants.co.uk here.